Pahari aloo recipe is a regional culinary gem that has its origins in the hilly terrains of Uttarakhand. Pahari (pahari comes from the word ‘pahad’ meaning mountain) are ‘the people inhabiting the hills” across the Himalayan region of India. Like the pahari people, the pahari food is simple and unpretentious. A close friend of mine belongs to pahari region of Uttarakhand and I have been fortunate to relish her simple home cooked pahari khana on many a occasion. Whenever she comes back from her home town, she brings me rajma (kidney beans), lemons, spices like jakhiya and dadim (dried tiny pomegranate seeds), mungaudi (dried moong dal balls), baadi (dried urad dal balls) and bal mithai (brown fudge type sweet coated with poppy seeds). Pahari food comprises of two regional cuisines, namely, Garhwali cuisine and Kumaoni cusine which boast of many exquisite rustic, nourishing and wholesome recipes that are mostly plant based, simple to make and extremely flavorful. These cuisines are healthy as they comprise mostly of cereals, pulses and leafy vegetables. Few of them include mandua (finger millet rotis), bhari roti (roti stuffed with cooked pulses called gehet), kandali saag (nettle leaves), kafuli (spinach dish), chainsu (urad dal), ras, bhatt chutney (made with small black soybean), khatta, pahari aloo palda and aloo gutke. Traditional pahari cuisine uses a variety of herbs and spices unique to that region. Jakhiya is a spice indigenous to the himalayan region and used predominately in garhwali and kumaoni food. It is aromatic, resembles mustard seeds and has a unique, crunchy flavor. 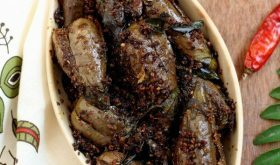 Most dishes that call for tempering of spices, be is aloo ke gutke, hara saag or dals like phaanu, is done in mustard oil or ghee. If you want to savor the authentic flavor of pahari food, jakhiya spice is an essential ingredient. The humble potato, abundantly produced in the hilly areas of Himalayan region, popularly known as “pahadi aloo’ is very flavorful and in great demand compared to the potato variety grown in the plains. Pahari aloo recipe aka aloo gutke is a simple, no onion no garlic, every day potato fry. This sukhi sabzi has an earthy comforting flavor especially in the winter months. In fact, aloo gutke is a very popular snack among the local people and tourists and is sold by road side tea stall vendors. It is also served as a side dish with roti or puri. You can serve it as a party appetiser too. 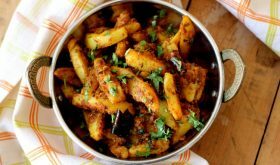 Pahari aloo recipe is one of the simplest Indian side dishes you can make in less than 10 minutes provided you have some boiled potatoes on hand. It is a dry saute potato dish wonderfully golden in color with earthy flavors making it a comforting winter dish. 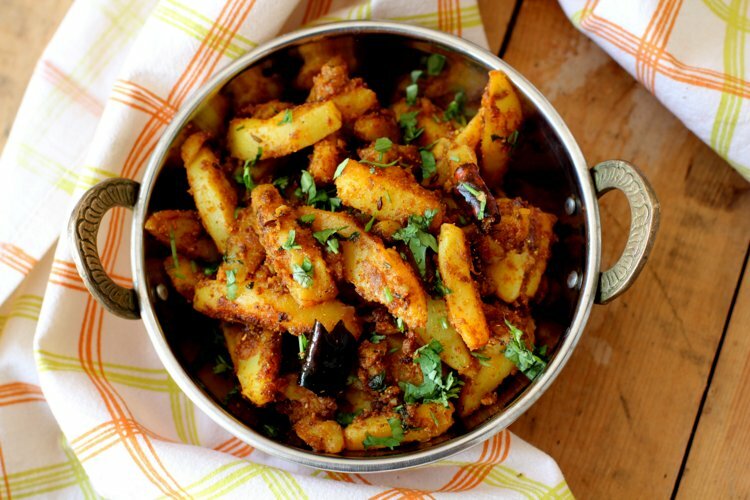 Pahari pototoes are cut into thin length wise pieces or cubes, tempered in mustard oil with aromatic spices like jakhiya, cumin seeds, dried red chillies and cooked on low flame till soft, tender and crusty. 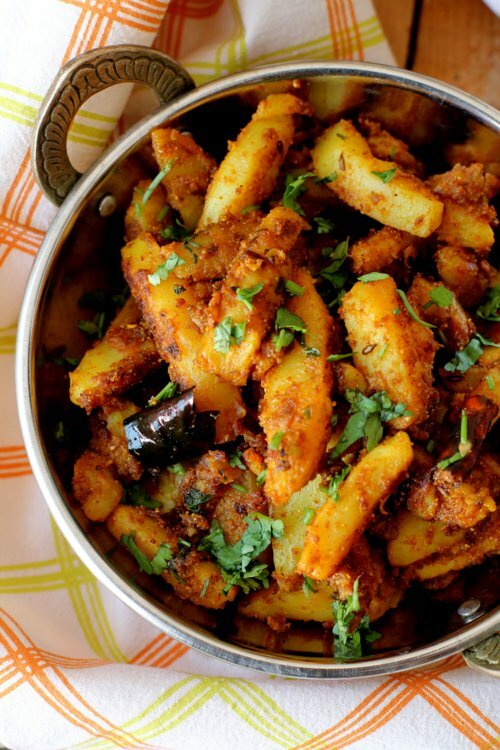 Many home cooks use boiled potatoes to make aloo ke gutke. I served aloo gutke with masala paratha but you can also serve it puri, roti or chapati. 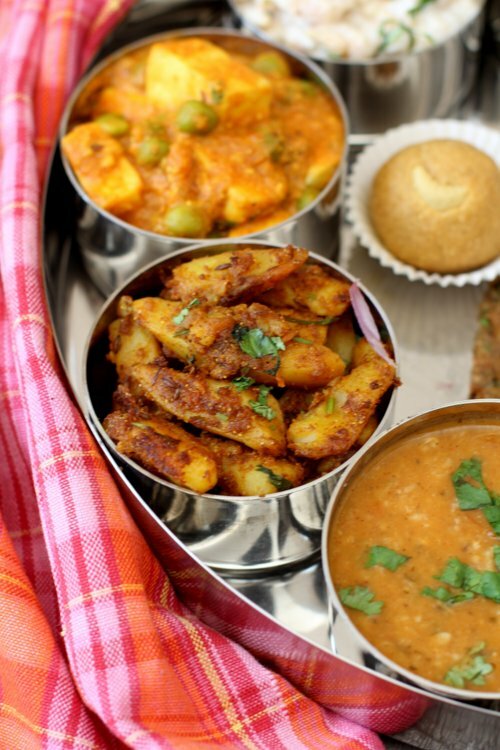 You will find hundreds of Indian food recipes with variations to the basic aloo fry but pahari aloo ke gutke is definitely one of the best dry saute dish among aloo recipes. Heat mustard oil in a heavy bottomed vessel till smoking hot. Reduce flame, add the cumin seeds and jakhiya and allow to sizzle and splutter. Add asafoetida and dry red chilis and saute for few seconds. Add turmeric powder, chilli powder, coriander powder and salt along with 2 tbsps of water. Mix well and immediately add the sliced potatoes. Mix well to coat the spice powders and place lid. Cook on low flame. After 10-12 mts, remove lid and mix the contents to ensure that the potatoes are cooked properly. Again after a few mts, mix again. Once the potatoes turn soft and golden, cook on high flame and toss the contents continuously so that they do not burn. Do this for a mt and turn off flame. Remove to a serving bowl and garnish with fresh coriander leaves. Serve warm as a snack or with roti or puri. Alternately, you can boil the potatoes till soft on touch and follow rest of the recipe. You need not cook the boiled potatoes for more than 3-4 mts after the tempering process.